Jim Hiscott (b. 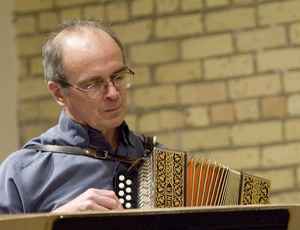 1948) is a Canadian composer, accordionist, radio producer, and an associate of the Canadian Music Centre. His style is characterized by a strong rhythmic base and a combination of world music elements with contemporary sounds and instrumentation. Hiscott decided to pursue a music career in the seventies, during his graduate studies in theoretical physics in England. He studied at The Royal Conservatory Of Music from 1970 to 1976 and received a Bachelor of Fine Arts degree from the York University. In 1977, Jim Hiscott became a music producer for CBC Radio Canada in Toronto. He founded the Manitoba Composers Association in 1981 and served as the first president. In 1986, The Winnipeg Symphony Orchestra conducted by Kazuhiro Koizumi gave a world premiere of Hiscott's Planes (1973).